Sweet potatoes are delicious and easy to grow, not to mention really nutritious. I think many people don’t grow them because they don’t know how. Sweet potatoes are grown from small plants called slips, although I usually refer to them as sweet potato starts. You can order slips from catalogs and sometimes find them at your local garden center, but I would like to encourage you to grow your own. The ones coming from far away often look pretty battered and they were probably started in climates different from your own. I start the sweet potatoes to grow my slips in my coldframe, keeping the cover handy in case the weather dips. I don’t put them in until about the time of the last expected spring frost, which is April 25 around here. That’s when space opens up in my coldframe. I know I’m showing off a little with that picture, but I got 20 slips off that one potato! That variety is Ginseng. I usually figure to get at least about 10 starts off each potato. I also grow Beauregard and the leaves are different. I put the sweet potato halfway into the soil, laying it down as a boat. When the sprouts grow out, you nick them off the potato and don’t worry about there being little or no roots. Plenty of roots will grow off the stems. That gives you a plant with a tiny piece of the potato attached. Put it into the garden bed right up to the leaves. Sometimes I might nip the plants off when they are much smaller. In that case I would put them in a pot or flat, buried right up to the leaves, allowing them to grow out a little more until going into the garden. You can leave the potato in the ground when you nip off the first slips and more will grow. 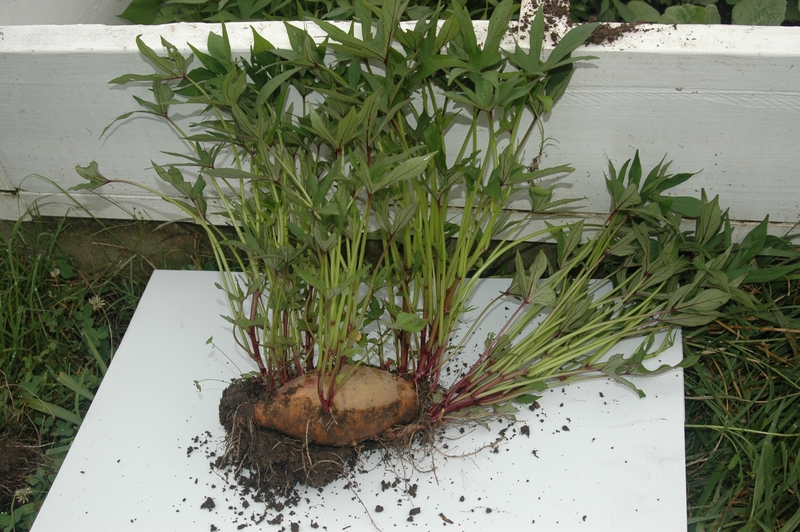 Sand Hill Preservation Center has some great information about growing sweet potatoes. They are located in Iowa and grow all their slips. If you are worried about getting your sweet potatoes in too late or that your nights are too cool, you will find their information helpful. I used to be in a hurry to get them in the ground soon after the last frost, but sweet potatoes do best when the soil has had a chance to really warm up and with the rotation I’m working with, I don’t need them until about the first week of June. 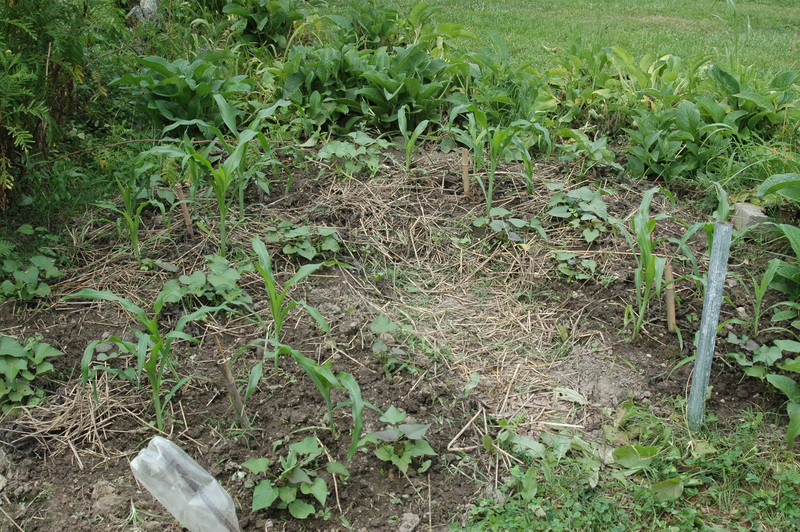 I usually interplant sweet potatoes with corn, putting them in about two weeks after I’ve transplanted the corn. The corn gets transplanted into a mulch of rye and Austrian winter peas about two weeks after that cover crop has been cut and left in place. The rye/winter pea cover crop is cut with a sickle when it is shedding pollen, which is usually about the first week of May here in Zone 7 in Virginia. On my website at www.HomeplaceEarth.com, you can see a picture of what the rye looks like when it’s shedding pollen. In my DVD, Cover Crops and Compost Crops IN Your Garden, I talk about that system and you see me digging the sweet potatoes at harvest. I usually harvest them around the first week of October to make sure to get them out of the ground before the frost. This picture of sweet potatoes interplanted with popcorn can be seen in my garden in my DVD, Develop a Sustainable Vegetable Garden Plan. The companion CD with that DVD has a copy of the rotation plan for the seven beds in that garden. 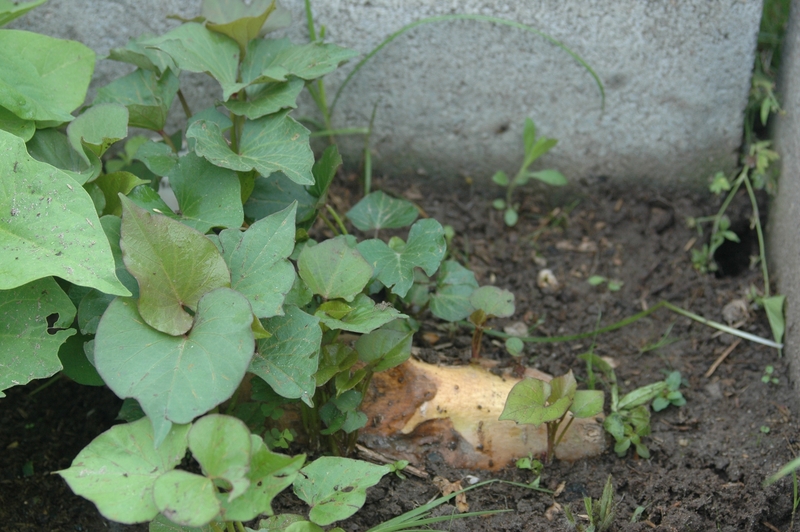 The sweet potatoes grow out and become a living mulch for the corn. There are other ways of starting sweet potatoes, but this is how I do it. I hope you give sweet potatoes a try in your garden. Coming up on Saturday, May 7, I’ll be in Kidron, Ohio at Lehman’s Hardware for their Spring Open House. Look for me in the Garden Room from 10am-3pm meeting people and answering gardening questions. If you live close, come on by. If you live far away, it may be time for a road trip if you’ve always wanted to visit Lehman’s. Be sure to introduce yourself and tell me about your garden. This year, looking for something meaningful to do for Lent, I’m repeating what I did in 2009. I decided that on the Fridays in Lent I’d eat only what I’d grown. It is both a challenge and an opportunity in so many ways. Since I’m an experienced grower, this might appear to be easy, but February, March, and April are lean times in the garden, with stored supplies becoming low, and I would need to provide all my calories since, except for eating less on Good Friday, I wasn’t fasting. Besides knowing I could do it, I wanted to better understand what it would take if, as communities, we needed to depend only on local food supplies. Further from home I thought about the people in impoverished areas worldwide whose food supply was already limited to local production. I feel that if we truly want to help people feed themselves worldwide we need to first understand how to feed ourselves from local supplies. The only things that would be included in my meals that I hadn’t grown would be salt for the sourdough bread and fermented vegetables and pickling lime for the hominy. Anything in bold and marked with * is included on my new recipe page. See the recipe tab above and go there to learn how I prepared it. That first Friday in 2009 my most important insight was the need for clean water. Without water I couldn’t prepare a meal. Fuel is an issue, but I’ll stick to food in this post. I grow Bloody Butcher corn to grind for cornmeal, so breakfast was easy. Although I usually make cornmeal mush with milk, I cooked it with water. I was fortunate to have honey from my bees, not a lot, but enough. I used the honey on the mush and in herb tea, but I could have done without it if necessary. The herbs for my tea were a mixture of bee balm, spearmint, and lemon balm. Sometimes I add sage and basil. Mississippi Silver cowpeas are the dried beans I grow for our table and I used them for lunch and/or dinner. Easter is late this year and the collards and kale are bolting now, but they have been an important addition fresh and dried. In 2oo9 I had what I called “fall ferment”*. I chopped the vegetables to a relish after they fermented whole in the crock. A dish of collards and fall ferment is good. In the photo above you see that, plus poached eggs and wheat tortillas. In 2009 I had wheat for tortillas and sourdough bread. I allowed some eggs both years because I had grown a small amount of the chicken’s feed. My supply of onions was running low this year, so I rationed them over the seven Fridays. I didn’t have any wheat left to use this year, but I did have sorghum that I grew several years ago and hadn’t used. Using the eggs, I made sorghum noodles that we ate with tomato sauce*. Steamed collards completed that meal. Those leftovers went into a soup early the next week, along with green beans (home canned), garlic, onions, celery seed, and dried Jerusalem artichokes*. That soup was meaty in taste and appearance, I guess due to the sorghum noodles I had chopped up. It was so good I saved some for the next Friday’s dinner. Sweet potatoes have been a plus. Sweet potatoes, greens, and cowpeas are a good meal. Although I often have butter on sweet potatoes and cowpeas and vinegar on the greens, I easily enjoy them plain on Homegrown Fridays. 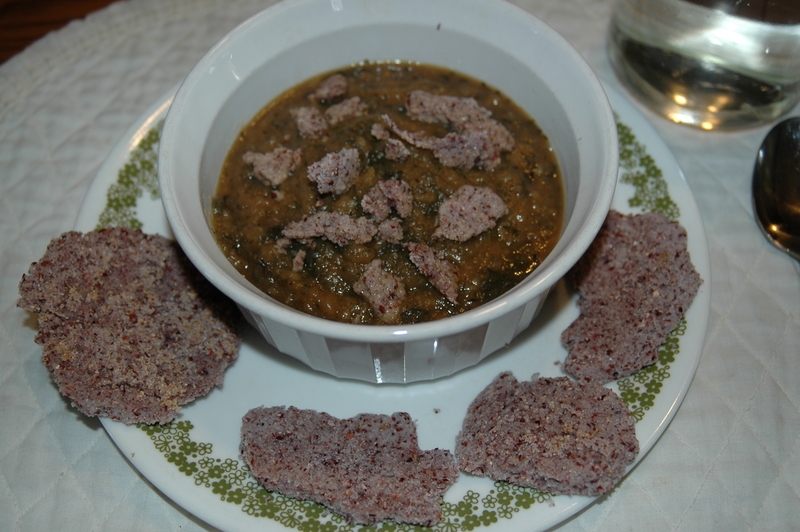 I eat the greens (kale and collards) steamed, the cowpeas boiled and simmered, and sweet potatoes baked. I have never owned a microwave oven and believe it destroys nutrients in the food. Sally Fallon agrees with me on this in Nourishing Traditions. One Friday I made a dish using masa (ground hominy) I had made from my corn. My plan was for tortillas, but that wasn’t working that day, so I layered the flattened masa dough with mashed sweet potatoes, boiled cowpeas, and steamed greens, lasagna style. I topped it with tomato sauce and baked it. You can mix any flour you make from your grain with water, roll it out, and use it this way with whatever you have to use as a filling. 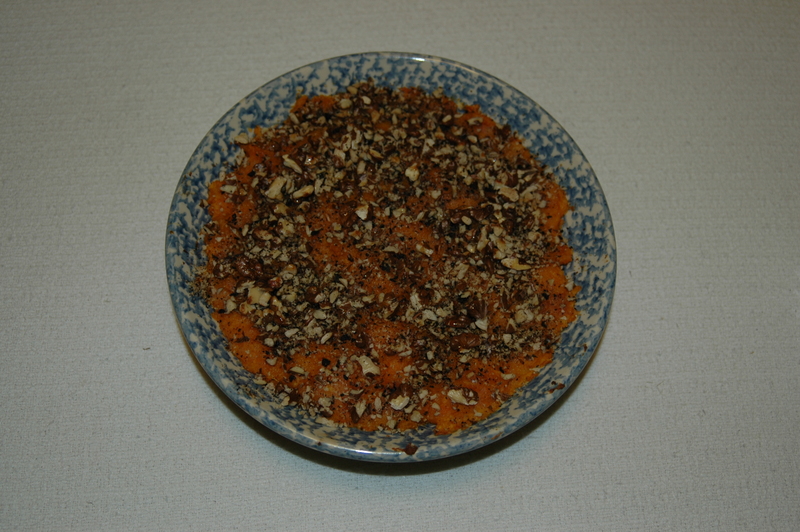 Last Friday I finally got around to shelling some black walnuts I harvested in September and used them as a topping on mashed sweet potatoes. I drizzled honey over that and baked it for about 20 minutes. Yum! One thing that became a favorite quick lunch this year is soup made with butternut squash leather*. 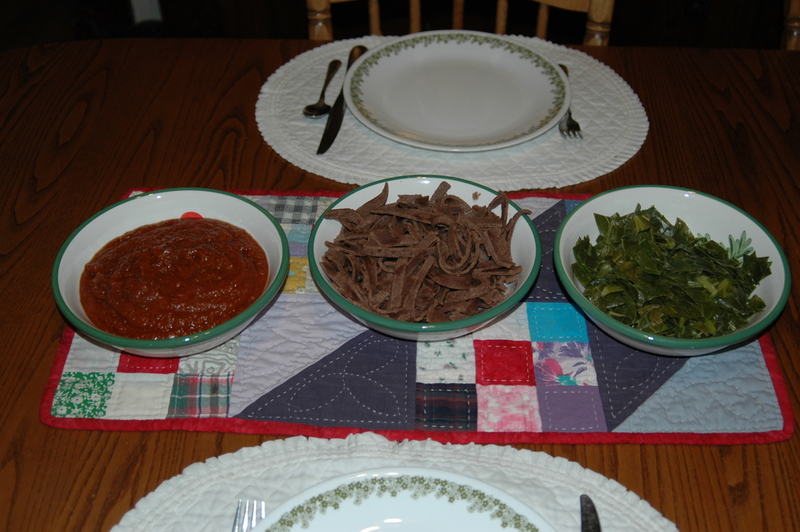 That plus dried kale or collards all cooked in water with maybe some leftover cowpeas was a great lunch. I also used zucchini leather* for the same purpose. Make some corn patties* and chop some into the soup. Raisins from our grapes were a welcome snack between meals and we even enjoyed some mead made from our own honey and grapes or elderberries. I discovered that my homegrown popcorn could be popped in a pan without adding oil. My staples this year were corn, sweet potatoes, greens, squash leather, dried tomatoes, and cowpeas, with a limited amount of eggs. If you find that interesting you should read The Resilient Gardener by Carol Deppe. This was an exercise for me to explore a homegrown diet. In reality we don’t have to do this alone. We live in communities and if we use our talents and resources wisely we can each do what we do best and share the surplus through our local economy. I surprised myself at the variety of the meals I came up with. You might want to have similar meals, adjusted to your circumstances. Even if you don’t grow anything, a meal of only locally grown food could be a challenge in itself. If you do start to think about this, don’t be too hard on yourself and become overwhelmed. Long ago one of the first milestones I reached was to grow and can enough green beans for the year. Another was to be able to make spaghetti sauce with all the ingredients coming from the garden. Maybe growing all the parsley and basil you’ll need for the year, or the herbs for tea, is where you’ll start. These meals were not meant to supply any specific nutrients or calories for a day. Their goal was to be tasty, homegrown, and fill me up. My husband, a less adventurous eater, joined this project only for the evening meal and he enjoyed every one. This week on Good Friday I’ll be preparing a soup made from cowpeas, sorghum, and dried tomatoes, peppers, green beans, Jerusalem artichokes, and hominy. I’ll add garlic and the last of the homegrown onions. My food is grown using biointensive techiques, feeding back the soil as I grow. I’ll spend time reflecting on the fact that I have the means to buy more onions and anything else I may need at the grocery store, although that food may not have been grown in a way that nourishes the earth. I’ll be mindful that buying food is not an option for many other people in the world, no matter how it is grown. It all comes down to the eating. What will we eat, and will there be enough for all. I am writing this blog to people who have seen my videos or heard me speak and wonder what I’m up to now. I am also writing to my former students, who I just know are making a difference in their local food systems. For those of you who just heard of me, I’m writing to you, too. My work with garden planning and cover crops is documented in my DVDs Develop a Sustainable Vegetable Garden Plan and Cover Crops and Compost Crops IN Your Garden. If you haven’t seen them yet, I hope you do. My next work is to explore getting the food from garden to table with the least fossil fuel. You’ll be hearing about solar cooking, solar food drying, rocket stoves, haybox cooking, and grain mills. Other considerations are what would be needed to grow a complete diet. Crop choices can make a big difference in successfully feeding ourselves. I’ll also write about my current cover crop and garden planning issues, beekeeping, and about sustainable lifestyles in general. All of these things fall under the general title of permaculture. My next post will be about my Homegrown Fridays. These Fridays in Lent I’ve been only eating what I’ve grown, so stay tuned. There is change about and we need to step up our learning. By learning first to feed ourselves, we can better reach out to help others around us. It is my wish that the community that develops around this blog will expand, each of you becoming a catalyst for positive change wherever you are. My husband and I chose the name Homeplace Earth because if the earth is homeplace to almost 7 billion people, we better take care of it. Please share your comments as we travel this journey. Together we can make a difference.